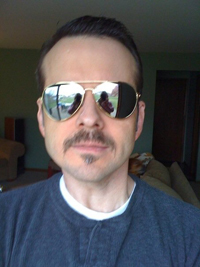 The attached photo shows my final Movember Mustache in all it’s 70’s-era-cop-show glory. I was aiming for a tribute to Frank Zappa, but this is as close as I could get in a month. It looked only slightly less ridiculous without the $0.95 mirrored aviator sunglasses. I would like to again express my deep appreciation to everyone that sponsored me during this month-long fund raiser. The event itself was certainly silly, but the cause was very serious. I am proud to have helped raise some money for the Prostate Cancer Foundation, as well as a little more awareness of men’s health issues. Darren, not bad for only one month ! I beleive it took Frank Z a bit longer to grow his to its fullness. Leave it for a year to see what kind of bush you could have.